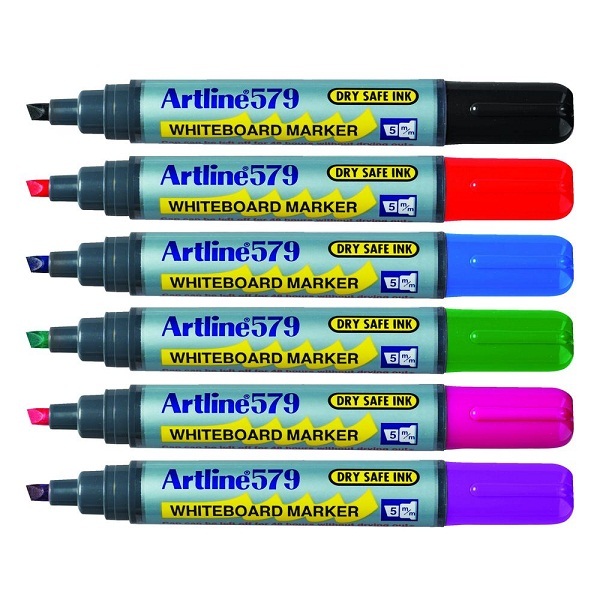 These Artline 579 Whiteboard Markers are ideal for use on your whiteboard or dry erase surface. Each marker contains alcohol based pigment ink which delivers bold, dense colours that are sure to stand out on your board. Each marker has a chisel nib which can mark between 2 and 5 mm. They are ideal for use on whiteboards and other dry erase surfaces. The ink formula is designed not to dry out if left uncapped for up to 48 hours. Each marker has a coloured cap which matches the ink colour. This pack contains 6 markers with 1 of each black, red, blue, green, pink and purple.